Here at Wabash Valley Farms, we're definitely not boring, so we created a brand new shape for eating popcorn. 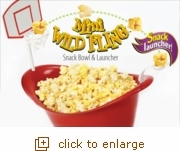 The brand new Popcorn Sports Bowl isn't just a snack bowl...it's also a snack launcher! Bowl Dimensions: Top Diameter 11", Bottom Diameter 3.5", Width 7" and Height ~5"
We sincerely hope your family will enjoy them as well!